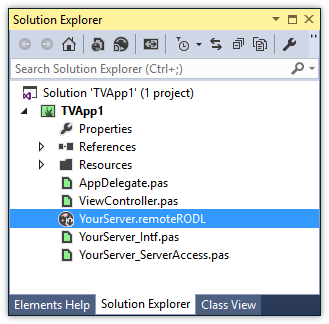 This option is available for Visual C# and Visual Basic projects, as well as any Elements (Oxygene, RemObjects C#, or Swift) project on all three platforms (.NET, as well as Cocoa and Java). 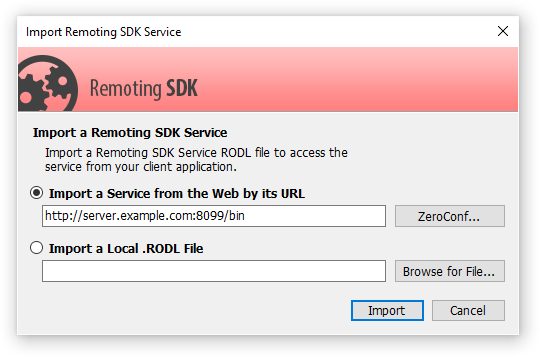 Selecting it will bring up this simple dialog, where you can specify the URL of your service (complete with port and path to RODL, so commonly that will end in :8099/bin), browse for a local .RODL file on disk, or detect a server on the local network using ZeroConf (a.k.a. Bonjour), if installed.